The title of this entry seems familiar? Well In “fatherhood with Ibe” was (or is, I’m not sure) the name of one of the several columns in Hints; a Nigerian romance magazine which was at its’ peak in the later half of the 1990s. With Exschoolnerd affectionately calling me Papa Ikenna and Yosh shopping for names for his yet unborn daughters I was finally sufficiently inspired to throw out these “notes from the hyena’s belly” (thoughts which have been on my mind for some time. Props to the Naija blogger with a same named blog) on fatherhood gone wrong. Here’s the first example of fatherhood gone wrong. An old timer who doesn’t carry his kids…sons along in his business moves and is stingy and withdrawn from his own family. He doesn’t womanise or drink neither is he the overly religious type. It’s hard to figure him out except that he’s seriously mistrustful as a result of going through a tough childhood and rise to the top. It’s really a shame that the first time I was able to step foot in his house was upon his death on a consolation visit to the family. Now the grown sons are facing the uphill task of trying to get familiar with their hitherto unknown relatives so as to give pops man a befitting burial as well as trying to put a hand on and coordinate his numerous businesses so as to ensure family survival. That’s the picture from the angle I got to know about him. The second case of fatherhood gone wrong is the Baba who runs his home like a dictator. He stresses out his kids and embarrasses them in the presence of their friends. The gospel according to Baba is that he can do no wrong. When there’s trouble you’re to blame he can’t possibly ever be at fault. With a bad temper to match Baba shouts down Mama, Mama in defence shouts down the kids and the kids learn fast by shouting down their own unfortunate victims. Baba unsurprisingly can’t deal with difficult situations calmly, he must always resort to abuse, scolding and raised voices. As a result Mama and the kids are now conditioned to think that’s the rightful first step to take in contentious circumstances. The end result is a blood hound family blind to the fact that life can be lived according to the cardinal principals of peace, love and respect despite the challenges along the way. My closing piece: “Fathers effing up should start to do the right thing”. Whatever man...vote Pat Utomi for president and send me a birthday cheque on April 17th. Peace! 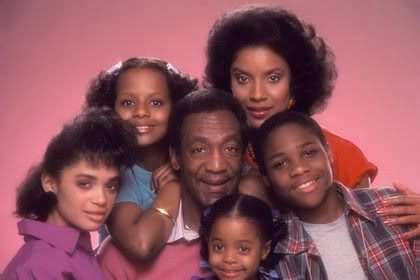 Bill Cosby and fam, fatherhood gone...right! Very interesting yet valid discussion here. Happy Birthday, man. Just saw an alert on NaijaYouth…hope you have a good one.